Dear OGBs, Friends, Well-wishers, Supporters and Staff of Dr Graham’s Homes, it gives me great pleasure to send you the Spring Newsletter under my name not only as President but also as Editor of this edition (until we can find someone to take on this voluntary post). The Big Freeze: What a start to our year! With the cold snap continuing through to February it has been the bitterest winter Britain has had to deal with for decades and after weeks of heavy snow, harsh frost and freezing weather, some good weather would be most welcome. Haiti: What great sadness. A devastating earthquake hit Haiti on 12th January at 10pm (GMT) causing an unfolding humanitarian crisis south of the capital, Port-au-Prince, with thousands of people dead and millions left homeless .The worst Earthquake to have hit Haiti in 200 years. Over the coming weeks and months financial help will be needed to provide food, water and shelter and a long term response will be crucial in helping the people of Haiti get back on their feet after their lives have been torn apart. Support: We’re not alone in the challenges ahead; we know that many organisations are struggling to survive at the moment – including many others who are providing support services to vulnerable people across the world - but I would invite you to pray with us that the school (our school) will continue to progress under the Leadership and guidance of Philip Gibson, that we continue to support him on his journey through 2010/11, during these most difficult of times. Wishing you all a Healthy, Happy and Prosperous 2010! 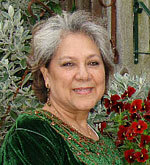 Margaretta Purtill - President of the Kalimpong Association (UK). So, what’s in store for us for the remaining of the year: We have the OGB Summer dance coming up in May. Our AGM in June followed by the Birthday Celebrations in September. Also, there is an OGB Re-union up in the school in September. It is hoped that OGBs from all over the world will endeavour to make the trip . This happens every 5 years. The next reunion will be in 2015.
under the care of two house staff. They were undertaking supervised coaching classes. They were given the opportunity of studying in a tranquil and conducive atmosphere, and are also enjoying meals cooked in the cottage. The other house-staff returned on the 10th of February to reopen cottages in preparation for the Kolkata parties and remaining boarders who arrived on the 12th and 13th February. The staff and children welcomed the cycle group on the 20th February. Sunday 19th September: Birthday & Graham-ite Re-dedication Service 9.30 a.m.
Tuesday 21st September: Inter-cottage Swimming Gala 9.00 a.m.-- Senior School play - 4.30 p.m.
Wednesday 22nd September : K.G. & Junior School Drill display - 9.00 a.m. -- Band Display - 9.15 a.m.; SUPW & Hobbies Exhibition - 9.30 a.m. Singing Competition - 4.00 p.m.
Thursday 23rd September - Employees' Birthday celebrations - 9.30 a.m.
Friday 24th September - Birthday gathering - 9.00 a.m. Most readers of the Kalimpong Association (UK) Newsletter will have passed through Dr Graham’s Homes (DGH) and have probably spent many of their formative years in both school and cottage life. Memories of their stay and education in DGH are almost certainly vivid. This ‘period of their lives’ was either supported by parents or relatives and/or, by benefactors, resulting in a resounding education and a social experience of working together in respective cottages with people from all walks of life. Altogether an experience which would stand many in good stead for the rest of their lives. It is amazing how this unique bond with Kalimpong strengthens as we mature and progress through life with our minds often recalling experiences both humorous and serious. Our strong principled Christian upbringing has, and will see us through life. As we have so abundantly benefited from DGH’s education and character training, so must we think of others who are also in urgent need of similar care and attention. A cheque made out to the Charitable Trust, C/o, Alec Murray. 66 Narksbury Avenue, Richmond, Surrey, London TW9 4JF. El: 020-8876 0709. 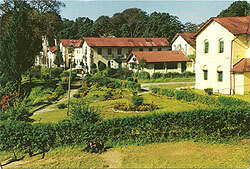 Philip Gibson, Dr Graham’s Homes, Kalimpong, West Bengal, India. I feel sure that there are enough of us to rally to this very worthy cause. Please give generously! Thank You. Margaretta Purtill (Byers), Thorburn Cottage. Scotland: Rosemarie Baker, Lady Sedhar Chozam Ball, Rosa Foo, Vanda Fraser, Frizzelle sisters: Annette and Nancy, , Ken Hammond, Estoners: Annette and Nancy, Ken Hammond, Eston Kilgour, Kitty Morley Campbell,Minto sisters: Lesley Walker and Rosemary Maharjan, Mary Palmer, Margaretta Purtill, Florence Snell, Alice Strong (nee Grant, left the Homes in 1945). Staff: Bertha Barclay, Ann Colquhoun. Among the guests were: Ursula and Peter (family of Andy Ross dec.) and a group of cyclists who are taking on the 2010 Bike Bengal Challenge. Entertainm ent: Biren Rongong and Rosemarie Baker; live band for Scottish country dancing: Auctioneers: Margaretta Purtill, John Cook – costume jewellery and a painting. Winners of raffle prizes were all smiles. - Florence (Snell). Siri (Doris Fox) Jarrett from Montreal, Canada, Christmas 2009. My husband Greg, and I, had the trip of a lifetime in Spring 2009, when we visited Australia, New Zealand, Hong Kong , and Bangkok. Then, in May 2009, our whole family, Including grandchildren, had a private meeting with His Holiness the Dalai Lama.In the Summer I enjoyed a lovely farm holiday with my daughter, Nima, in Saskatchewan, where she lives. In August we received the sad news of the sudden passing of our brother JIM FOX (in Australia). In October I enjoyed a weekend with JEAN CHAPMAN and her sister Ellena (Christie) who was visiting from the UK”. His Holiness the Dalai Lama Visits New Zealand 4th – 7th December 2009: There was great excitement as we waited for His Holiness to arrive at the airport on 4th December. With a white Khata in my hands, I welcomed His Holiness to New Zealand. I introduced him to Mr. Bishit, the second secretary of the Indian Embassy, who welcomed His Holiness on behalf of Government of India. After a brief short interview with Maori TV, His Holiness met with Hon. Phil Goff, leader of the opposition and Darian Fenton, co- chair of newly reformed Parliamentary Lobby Group for Tibet. of the Tibetan Children’s Relief Society spoke and asked His Holiness to present two Life Membership Certificate honouring the work done by those who started the Society back in the 1960s, me being one of them as treasurer for 42 years and still hold the post. His Holiness met with Green Party MPs and they discussed the Tibet’s environment issue. His Holiness said that we talk about North and South Pole; the Third Pole is Tibet, where major rivers of Central Asia start from Tibet. Any destruction of that will spell major disaster for Asia and we need to protect the fragile ecosystem of Tibet in order to avoid disaster later on. They were joined by other MPs from the cross-party Parliamentary Lobby Group for Tibet. His Holiness spoke to them about the Tibet issue between China and Tibet and he stated that he is not seeking separation from China but seeking for genuine autonomy within the framework of the Peoples Republic of China. So far there has been very little response from China, although they met 8 times. He urged them to help wherever they could to promote the Middle Way Approach to solve the issue with China. There was a brief discussion on the 5th World Parliamentarians’ Convention on Tibet, meeting in Rome on the 18th and 19th of November 2009. 2pm at Vector Arena, His Holiness was welcomed on the stage by Ngati Whatua, the Maori tribe of Auckland. Then he gave a public talk to the crowd of about 7,000 on the topic of A PEACEFUL MIND. Sunday 6th December: 9am His Holiness met with the Tibetans living in New Zealand. I delivered a brief report on the Tibetans His Holiness spoke to us about the importance of modern education and that we must educate our younger generation to the highest possible standard. He also said we must pay attention to the preservation of our Buddhist culture and the Tibetan language, and try to teach our younger generation the Tibetan language, and must uphold the honour of the Tibetan. His Holiness left for Vector Arena for the morning session of the teaching “Nagarjuna’s Commentary on Bodhicitta” About 2000 attended the teaching. A vote thanks was given by Mr. Simon Harrison on behalf of the Dalai Lama Visit Trust New Zealand to His Holiness. This was followed by an invitation to Ven Amala Wrightson to say a few words concerning the offering of a text of Dhammapada to the New Zealand Parliament. The New Zealand Buddhist Council will present this copy of Dhammapada in Pali, English and Chinese to the House of Representative of New Zealand to sit alongside the Bible and Koran as a spiritual reference for our members of Parliament in the House. His Holiness left for a visit to North Shore Hospice, where he met with a few in-house patients and gave a talk to the members of North Shore and Amitabha Hospice care-givers. The next day His Holiness left on an early morning flight to Melbourne, Australia where he attended the World Religion of Parliament. His Holiness was the keynote speaker at the conference. Although His Holiness visit to New Zealand was very short, it was great experience, especially for those who heard him speak for the first time. They will always remember his message of Peace, Love and Compassion. Both my husband John and I felt honoured and privileged to have been invited to attend the 80th birthday celebrations of Mr. Brooks, especially as he informed us that it was going to be a small gathering with mainly family and close friends. We had been thinking about having a winter holiday in Kerala, India and this decided it. We first went to our favourite beach resort in Kovalam and then flew to Calcutta two days before the big event. The invitation stated an 8.00pm start with the birthday toast being given at 8.30pm and like everyone else we arrived promptly and were warmly greeted by Pauline, Anita and Brinsley. The banquet hall was centrally situated and within walking distance from our hotel. It had been beautifully decorated, with a bar and tables set out. There were just over 60 guests; this number grew every time I spoke to Mr. Brooks, I think it started with 25, but of course his popularity is so great I was somewhat surprised that the number hadn't reached 100. All the guests had a Dr Graham's Homes connection apart from six who were ex pupils of St Paul's School, Darjeeling where Mr. Brooks commenced his teaching career. Pauline, who was the MC for the evening, opened the proceedings with a very warm welcome to all the guests and an emotional tribute to her father. Then followed a short interesting speech by Jassy, Pauline's husband, and a very witty and warm speech from Anita, Brinsley`s wife. Mr. Brooks was about to take the stand when Mr. Richard Flynn, ex-Principal of La Martiniere for Boys requested he may say a few words on behalf of Heads of Calcutta Schools. No sooner had he finished when requests were made by an ex-Paulite and Old Boy Albert Temple, now a senior Principal himself. The theme of all was gratitude to Mr. Brooks for his influence on their lives. Mr. Brooks also mentioned in his speech how very touched he had been by the arrival of the group photograph of members of the UK Kalimpong Association. He said it had pride of place on the cabinet in his drawing room and this we can vouch for as he very kindly invited us to his flat for lunch on Boxing Day and proudly showed us the photograph. Another emotional moment in his talk was when he referred to the two Paulites present who were part of the 1952 Senior Cambridge Batch he had prepared in Chemistry; that was 57 years ago!! He thanked his family for all their love and support, and the numerous OGBs who had welcomed and looked after him on all the overseas tours he had made over the years - even after retiring from the Homes. He concluded his talk with one of his favourite sayings: “ There is only one way to judge a good school. By the ‘end product’; the quality of the young men and women it produces. Judged on this basis Dr. Graham’s Homes and St. Paul’s School, must be rated as second to none”. Brinsley then responded to his father’s speech in a most appropriate and humorous manner and proposed the toast. 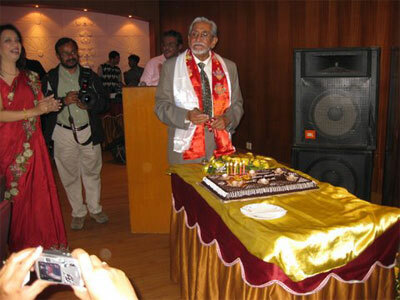 Mr. Brooks replied with a further toast to 2010 before cutting the delicious birthday cake which brought the formal proceedings to an end. We all tucked into an excellent buffet dinner while a live band supported by a very good 'crooner' began the music and it wasn't long before the dance floor was crowded with people dancing and having a great time. Apparently the party went on for the next three hours – til midnight – when the five Bene girls brought matters to a close by singing, "May the Good Lord Bless and Keep You". It was a fantastic evening, everyone had a wonderful time and most of all Mr. Brooks was able to keep up with the youngsters and stayed to the end. I just hope that I have the young looks, health and energy he has when I reach his age. The February 2010 charity ride covers some 670 kms, starting in Kolkata and finishing at Dr. Graham’s Homes School, Kalimpong India. 21 cyclists (19 UK+1 Germany & 1 Zimbabwe), are volunteering their time and financing their own trip and stay in India, to ride 7 days to raise money for the kids of this exceptional educational institution in the foothills of the mighty Himalayas. ..we were led through the high street of Kalimpong accompanied by the DGH fife and drum band playing the school anthem. All along the street masses of people greeted us with cheers and clapping – what a heart warming and splendid welcome! Thank you Kalimpong!! We stopped briefly at the Tibetan school whose principal Kesang Bhutia, also an ex-student and classmate (’72) was there with his students to greet us. He looks just the same as he did 36 years ago (I still think he was 44 yrs old back then!!). Not quite done though – we still had another 500 ft of climbing (about 3km) before we finally hit the school grounds! Lining the route from the stores to the Jarvie Hall were excited children clapping and cheering us on – an emotional, poignant moment for the riders but even more so for me. Words cannot express the gratitude I felt to be able to experience this moment with my son next to me! Philip Gibson gave a welcoming and warm speech – thanking us not only for our achievement but also for our support of the Homes. The next deed was indeed a joyous one – playing postmen/mistress by delivering letters in special envelopes to some of the sponsored children from their sponsors back in the UK. The Kpg. OGBS received the 19 members of the Bengal Bike 2010 outside ‘Soods hotel’ in kpg town and also at the reception outside the Jarvie Hall .We were there to congratulate all the bikers , and specially one who was 82.years old .We would love to convey our sincere gratitude for the effort they made to help the Homes. The Kalimpong OGBs have contributed Rs75000.00 ( I guess a little over UK 1000 pounds) .We missed Rev. Webster this year and sincerely hope that Mrs. Webster is much better. Passed away in December 2009. John lived in Bangalore with his family. He was in Calcutta Cottage 1952 – 1961. He leaves behind 3 Sons and two Sisters, Leoni and Anne. Thank you all for coming here today to say goodbye to Rosemary – more usually known as Rosie, Rosie-Min, Posy, Mrs M, Bhauju and Rojee (as our Nepali ayah Tara used to call her and which many others do now). More strange perhaps, was being called Marjory by her Diabetic doctor, Dr Walker. He’d shout out “Good to see you, Marjory” when he saw her in a corridor or at reception. We used to chuckle at this, but Rosie didn’t mind. You see, Dr Walker is a tall, good looking and very, very charming man, so Rosie used to say that she didn’t care what he called her, as long as he called her! To be fair, he always got her name right when it came to discussing her health. All these names were given with affection. And affection was something that nearly everyone who met Rosie instantly felt for her. We, the Maharjan family, and the Minto family, have been overwhelmed by the messages of comfort and sorrow that have come in from all over the world, particularly from the Old Girls & Boys of Dr Graham’s Homes. Rosie had extremely happy memories of her time in the Homes and in fact we reminisced about life in Jubilee House, the servants who looked after us, dear Tara, and friends just hours before she slipped away. Its difficult for me to stand here today and say anything negative about my wee sass. But we can’t pretend that she was an angel! She was human after all! She could be as stubborn as a mule. This trait showed itself when she phoned me to let me know that she was getting married in 3 weeks time to a chap called Dharma. To say I was surprised is an understatement, and to be honest, a little bit worried. We’d not met Dharma and knew nothing about him. Alison and I tried to suggest that she postpone the wedding so that we could arrange a more lavish affair but she would have none of it. Needless to say, we needn’t have worried. Their wedding was a hugely enjoyable day and Dharma and she looked so very happy. This stubborn streak would manifest itself from time to time, especially when in latter years I’d suggest that she might like to do some exercise, or maybe do the dishes? She had a temper at times (strangely only ever reserved for me – she even had the cheek to suggest that I nagged her!). We had some ding-dong fights which only ever lasted for a very short time and then we’d kiss and make up. She also had this irritating habit of leaving everything to the last minute. We’d have an appointment at 10am. At 9.30 she’d decide to get ready. While she got dressed, slowly, I’d be dashing around getting her medication, shoes, purse, coat, gloves, something to eat when she was out, house keys. We’d get to the appointment just on time. My blood pressure would be through the roof and she’d turn to me and say “I told you we had plenty of time – I don’t know why you get so worked up” and then saunter into the appointment as calm as anything, smiling away at all the people she knew. I think it would be fair to say that housework wasn’t one of her favourite pastimes, and she’d claim “people come to see Dharma and me, not the house” – which of course, was true. I want to take this opportunity to tell you all, as if you didn’t know, that I love my sister very much and am so, so proud for her. I’m proud of the way she managed the restaurant. She managed the staff at the restaurant with a surprisingly firm hand, but always with compassion. You can see today, the respect in which they hold Bhauju. (Staff from the restaurant, dressed in national costume, escorted Rosie’s coffin into the chapel). She also liaised with solicitors, bankers, salesmen and of course mingled with her customers, quite a few of whom are here today. I’m proud of the way she handled her ill-health over the past 8 years. Ann Colquhoun put it very succinctly in her card when she said “Rosie had so much to teach us about bravery and perseverance when in very ill health”. I’m willing to bet that when you think of Rosie, you think of her with a smile on her face, and with a positive outlook on life. Never did I hear her bemoan her lot or suggest that she had been dealt an unfair hand (which is what we all thought). Nurses in all the wards she stayed inn (and there were a few over the years) always commented on what a special person she was and that she was a joy to look after. I’m proud of her fierce loyalty to those she loved – especially to Dharma. She wouldn’t have a bad word said against him and always came to his defence. She remained constant in her love for Derek and Mairead and I’m so thankful that she was able to spend precious time with Derek before she died. I know that her love was returned – and I think she quite liked me too! I’m proud of her complete faith in mankind. She always saw the good in people and trusted them implicitly.I’m going to miss my Rosie-Min. I’m going to miss the little things – discussing the latest episode of Home and Away, our visits to the cinema (she was a film buff and has a large DVD collection). Her favourite film was “Dirty Dancing” and she had a thing about Patrick Swayze. I’ll miss her beating me at Scrabble which she did with worrying regularity. I’ll miss sitting with her in her conservatory on a Sunday afternoon, reading, doing crosswords, or just dozing. I’ll miss her singing in the shower when we would get a medley of songs that would include hymns, the Indian national anthem, a Maori folk song and a few pop songs. The hymns, the Indian national anthem and folksong were a constant, but the pop songs would change from time to time. I’ll miss our numerous phone calls during the day. Thanks to the ITU department at St John’s hospital, Livingston. We have had 8 very precious years that we perhaps shouldn’t have had. I have been able to get even closer to Rosie and I am so grateful for that. There wasn’t a night when we didn’t say “Goodnight, sleep well, I love you” to each other. I know Rosie’s gone to a better place. I know that she is out of pain. I know she’s looking down on us now and telling me to get on with it. Good night Rosie darling. Sleep well. I love you. We all love you. On behalf of the OGB’s in Bhutan, please accept our deepest condolence on the sad death of Rosemarie. We will always remember her fondly as a delightful and a beautiful young girl. Although we cannot be there with you in this hour of sadness, we want you to know that we share your grief and pray for deliverance of the departed soul. With Love and prayers. We are in grief at the sad passing away of Rosie. On behalf of all of us at the Homes, we extend our sincere condolences to the Minto family, and to Rosie's husband, Dharma. It is with shock that we heard of the passing of Rosemarie Minto. No words can ease the pain of the trauma for her family, our deepest sadness and sympathies, from the NSW Committee and all OGBs in Sydney Australia, to Rosemary's family and also Lesley and Derek. I remember her well and I understand the loss. Our beloved brother passed away peacefully on Friday 15th January2010. He was a kind and gentle person, always happy to help others. We would like to thank those friends, here and abroad, who sent cards, e-mails, phone calls and text messages with words of comfort at this very sad time. We shall miss our brother very much. We were sorry to learn of the death of Johnny Pearson. We were sad because johnny was also part of our group at the Carey Baptist Church, William Carey's first church and school in Bow Bazaar, Calcutta. Thanks again. Our mum, Hope and her identical twin sister Faith, were born on the 19 May 1921 in Abu Road, Rajasthan, India. Mum’s Dad Alfred Barnett was in the British Army serving in India and the family had just returned from a trip to the UK. Sadly Mum’s childhood was short lived as her Mother Iris Barnett died when she and Faith were only seven years old. After her Mother’s death her father retired and they moved down the road to Ajmer where Mum and Aunty Faith attended the Convent as day scholars. Unfortunately they were orphaned at the age of nine, as their father died two years later. They were then admitted to the Convent as boarders for a month. Being out in India with no family other than siblings and since none of their relatives were willing or able to look after them in the UK, they were admitted to The Lawrence Military School in Rajasthan. This was a very austere and cold place and Mum and Aunty Faith were treated very harshly. It is hard to comprehend what life must have been like for both of them and how scared and unhappy they must have felt. However, Mum often spoke of the happy times when they went to stay with their eldest sister Kitty during the school holidays. At the age of eighteen Mum and Aunty Faith joined King George’s and Queen Mary’s College in Lucknow to train as nurses. Mum loved sport, excelling in Tennis and she won many trophies in her younger days. Wimbledon was her passion but she also loved watching all the other tennis tournaments around the world. Mum met Dad in Mussouri and after a short six month courtship they married on 4 January 1947. The family soon grew – they had eight children – 6 girls and 2 boys and Mum was able to bestow all her love and care on us. Mum and Dad travelled quite extensively in India spending ten years in Nainital in Uttar Pradesh. Dad taught at Sherwood College and Mum was the School Nurse. They then moved to St Thomas’ School, Kidderpore, Calcutta for three years, followed by four years in Dr Graham’s School, Kalimpong where Mum was assistant Cottage Aunty in Laidlaw helping Miss Webb. The family returned to Calcutta spending two years in St Paul’s School, Scotts Lane, then on to Mount Herman in Darjeeling and back to Calcutta in Frank Anthony’s School and St Thomas’ School, Free School Street. Mum and Dad then returned to Kalimpong in 1971 where Mum taught Special Needs Children and their final spell was in Dehra Dun before emigrating to the UK. Mum and Dad came to England in January 1979 and soon settled into life in Swindon. Mum was reunited with her brother Eric and sister Kitty but had lost touch with her identical twin Faith. However, after a span of over forty years she was finally able to meet Faith after she appeared on Cilla Black’s “Surprise Surprise” and Mum and Faith were able to make up for lost time. Mum moved into Elsie Hazel Court nearly five years ago and for the first time was able to be independent and have her own space. Mum kept a beautiful flat and enjoyed being surrounded by photographs of all her family. Mum made many friends and especially enjoyed her Bingo sessions each week, the trips out in summer and the coffee mornings. Mum had a wonderful personality. She hated confrontation and we never really saw her lose her temper or heard her raise her voice. It must have been difficult bringing up eight kids but Mum never complained but just got on with things and we all knew that Mum was always there for us. She had high principles and believed deeply in her faith which sustained her all her life. Mum suffered a great deal physically towards the end of her life and we were all amazed at how strong and what a fighter she really was as she survived one illness after the other. However, once she became bed-ridden she deteriorated and it was heart breaking watching her get thinner and weaker. Even though we all know that it was only a matter of time, when the end came it still took us unawares, as we still felt that Mum would fight some more and defeat her illness but unfortunately she couldn’t take any more suffering as her body was too weak. We feel comforted that we honoured Mum’s wishes by ensuring that we looked after her in her own home and also that she died in her own bed in the flat that she loved. We are grateful to God for taking our mum in her sleep and that her passing was peaceful. At long last mum is no longer in any pain, is at rest and is now reunited with Dad. We hope that you are now at peace and in God’s loving care. You will live in our hearts forever. Born on 26th. August 1934 at Gauhati, Assam. Died: 17th December 2009 peacefully at home in Ewell, Surrey after a long illness. Les went to St. Andrew's Colonial Homes (now Dr. Graham's Homes), Kalimpong, along with his four brothers Ken, Patrick, Harold and John in May 1941. We were all Laidlaw Cottage boys and Les went on to Frazer ,along with his peers like John Christie. Les arrived in KPG at the tender age of 6 and a half and went on to complete his education there in 1951/52. He was the “middle sibling” of seven children and was certainly protective and caring to me the youngest. Over the years we recalled many memories of KPG and laughed at all the mischief we got into when at Laidlaw. The bigger boys once managed to catch and let loose a jackal in the dormitory closest to Aunty Humphrey's room. She took fright, to say the least, and the matter was referred to Mr. Duncan and 'Burra Lloyd' who duly 'doled out' the necessary punishment to the culprits! 'Bhutta' (sweetcorn) and sweet potato raids from the fields; oranges and pineapples from the Orchards and 'krunkers' (cucumbers) from the back garden of the Principal's house backing on to the Church. How we enjoyed all those picnics at Deolo and Tarkhola, fishing, swimming and camping at the Rilly. Sometimes we even sampled the local drink 'chung' made from millet! Leslie's early adult life in India was spent in management training at a Tea Plantation and Micah Mines before moving to the UK. National Service saw him in the R.A.F. followed by a long career with London Transport until early retirement. Leslie was married for 52 years and was devoted to his beloved wife Felice and their children Russell, Colin, Karen, Owen and Maxine, and to his ten Grandchildren. Our dear friend passed away peacefully at the Auckland Hospital in New Zealand. He would have been 84 this year. He went to hospital on 22nd December 2009 to have an operation on his leg. The doctor had told him that he might not survive the operation due to his weak heart, but he was in so much pain he decided to go ahead with the operation. We visited him nearly every other day and during the last week we saw him more regularly as he was not showing any sign of improvement. We have organised a service for him at the Selwyn Village where he lived on Saturday 23rd January 2010 at 11 am followed by a private cremation. We will miss him very much as we visited him in his little apartment quite regularly. As we say in Tibet when our loved ones pass away "May their soul find rebirth soon". Very sad news to hear that Bobby passed away after suffering a massive heart attack. Our deep felt condolences to the bereaved family. May the deceased soul rest in peace. Amen. One of the many unique features of Dr Graham’s Homes is the sense of family fellowship between OGB’s the world over; begun in cottage and in school and continues literally to the grave! This year, in September, hundreds of OGB’s will be gathering in Kalimpong to celebrate and what a wonderful gathering that will be! The remarkable thing about all these birthday celebrations is that those coming to the party don’t need to take a present to give to the one whose birthday is being celebrated! At the International Conference in Kolkata two years ago a suggestion was made by one of the UK delegates that on the 24th September each year OGB’s be invited to give a birthday donation to the Homes in gratitude for all they had received while at the Homes. This splendid idea was warmly acclaimed. However, to become realities ideas need to championed by individuals – in other words by each one of you reading this Newsletter. In practical terms each one might consider giving to the Homes this September a birthday gift of at least Rs1, 100/- (equivalent to only Rs10/- for every year of the Homes existence). Remember, you don’t normally go to a birthday party without taking a present. I know that many of you already give most generously but it seems to me that all too often the family of OGB’s meet to party and feast while DGH, the ageing parent, is in dire financial straits. I hope this doesn’t sound too harsh but in the last Newsletter with the exception of the London raffle there is not one mention of funds being raised at the Birthday Gatherings. The buns and jelabies good-time culture from school-day birthdays seems to prevail to the exclusion of all other needs! I do apologise if this a wrong impression. A frail old man went to live with his son, daughter-inlaw and four-year-old grandson. The old man's hands trembled, his eyesight was blurred, and his step faltered The family ate together at the table. But the elderly grandfather's shaky hands and failing sight made eating difficult. Peas rolled off his spoon onto the floor. When he grasped the glass, milk spilled on the tablecloth. The son and daughter-in-law became irritated with the mess. 'We must do something about father,' said the son. 'I've had enough of his spilled milk, noisy eating, and food on the floor.' So the husband and wife set a small table in the corner. There, Grandfather ate alone while the rest of the family enjoyed dinner. four-year-old smiled and went back to work. I've learned that, no matter what happens, how bad it seems today, life does go on, and it will be better tomorrow. I've learned that you can tell a lot about a person by the way he/she handles four things: a rainy day, the elderly, lost luggage and tangled Christmas tree lights. I've learned that making a 'living' is not the same thing as making a 'life..' I've learned that life sometimes gives you a second chance. I've learned that you shouldn't go through life with a catcher's mitt on both hands. You need to be able to throw something back sometimes. What is the colour of the “black box” in a commercial aeroplane? (Bonus Question) Who wrote Beethoven's Ninth Symphony? (Bonus Question) Beethoven, of course! Margaretta Purtill, the President of the Kalimpong Association wrote in the Newsletter “Every time a hand reaches out to help another…that is Christmas.” And Christmas is when God reached down to earth in the form of the baby Jesus. Chairman of the UK Committee, Rev. John Webster continues along the same vein… “The act of giving is what defines Dr. Graham’s Homes and what Daddy Graham was all about, continuing to help those less fortunate than ourselves.” And the 2010 Bengal Bike Ride did just that. John Webster, founder and organizer of the Kolkata to Kalimpong Charity Bike Rides, a venture that has been undertaken a number of times over the past few years, though this year Rev. Webster had to drop out at the last minute due to his wife’s illness, resulting in Kenneth Hammond, an OGB, stepping in to do an excellent job of leading 19 bikers including an 82 year old rider, Archie Tolkin. Through their efforts and time these bikers were able to raise funds for DGH of which Rs.75000 (1000 Pounds UK) from Kalimpong alone. “19 Cyclists (17 from UK, +1 from Germany +1 from Zimbabwe), are volunteering their time and financing their own trip and stay in India, to cycle 7 days to raise funds for the Kids of this exceptional institution in the foothills of the mighty Himalayas. 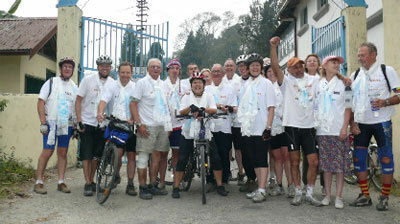 The February 2010 Charity Bike Ride covers some 670 Km, from Kolkata to Dr.Graham’s Homes School, Kalimpong, India. On the last day of the journey, February 20, 2010, 19 bikers left Siliguri at 6 am for the 70-km ride up to Dr. Graham’s Homes, Kalimpong. A large part of the ride, especially after the Teesta is steep uphill, so it’s no mean feat. Up to the Teesta the bikers were more or less together. The going got tough after that but all the bikers made it (reportedly several had to walk up the steep inclines). The first few bikers were at the Soods Garden Retreat, 9th Mile by 1pm. –2pm, the last of them by 3pm. They then rode through town, past a reception at the Tibetan School, and finally pushed up hill to Dr. Graham’s Homes, where they reached by 4:30pm. We were lead through the streets of Kalimpong accompanied by the DGH Fife and Drum Band playing the School anthem. All along the street masses of people greeted us with cheers and clapping –what a heart warming and splendid welcome! “The following morning we attended the up-hill School Church. One of the most memorable if not The most memorable services that I have ever attended. The spotless cathedral like church was packed to capacity with children. The front seats were reserved for us guests. The very apt sermons and hymns, followed by two pieces of choir music that was so outstandingly sung by the school choir that they would not be out of place at the Albert Hall. It was impossible to keep a dry eye as they were so moving and brilliantly sung and orchestrated. Absolutely Outstanding”! The newly appointed chief executive officer of DGH, Mr. Phillip Gibson and his wife Eleanor, are in the homes for a 2 year commitment to provide guidance and leadership for the Cottage and Teaching staff. They have given us a little insight into the many reasons for their dedication to be of service in their blog entries over the past few months. It includes accounts of the many roles they have been asked to fill, and all the various situations that they found themselves in, some of them very trying. Like the stressful time when a gravely sick child had to be transported to a hospital at the foot of the hills. All this can be read at their web page Philip Gibson Travel Blog. But though they accomplished many tasks and have reached many goals, it is one small snippet taken from Mrs. Gibson’s pen that sums up everything that they really came to Kalimpong for, and give us all a reason for continuing to support this school. Eleanor Gibson: “Hello again from Kalimpong. Whole chunks of September and October will be taken up with the Homes Birthday and the Puja Holidays. The sun is shining so we walk back to Ahava Guest House. We can’t wait for a view of the Himalayas from our bedroom window and a shot of the cloud receding from Kanchungunga for a few moments. On the way all the girls wave to us and as we pass Mansfield Cottage we meet up with Claire who gives us the promised Birthday Cake. We have it for pudding that night. At lunchtime 3 little girls who are Day Students come to my office for a chat, Matina, Smita and Bibashna (as day scholars they don’t have cottages or house parents). Ten minutes later they returned to present me with a slim little pencil case, and then they asked me to be their Aunty.” Enough said, no other reasons needed. At the Katherine Graham Memorial Chapel the children sing a Hymn. ..And can the Lord want to use our hands to answer someone else’s prayers? OVERSEAS MEMBERS - would you kindly acknowledge receipt of this newsletter so we can be sure that we are not sending it to empty mailboxes. EDDIE LAMB - Our thoughts and prayers go out to Eddie Lamb who is in the Moseley Hall Hospital. We wish him a speedy recovery.